Emily Millen Yoga: NO IMPACT MAN: Making a Difference One Step at a Time, One Person at a Time. 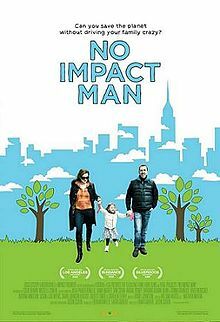 NO IMPACT MAN: Making a Difference One Step at a Time, One Person at a Time. I could go on and on about this documentary. It's about a man and his family, leaving no carbon footprint, or harmful impact on the environment for one year. AND they live in New York City, which would make the task even more impossible. Colin Beaven, the driving force behind this project, keeps things very realistic throughout, which I really appreciated. He wasn't an extremest, and he wasn't a know it all. He knew that his family would have to ease into it, so they swallowed one thing at a time. They started with no consuming, then graduated to eating a local, vegetarian diet. They then moved onto clothe diapers, ZERO GARBAGE, no TV, no toilet paper, and finished off with NO ELECTRICITY. They biked for a year, didn't take planes, and his wife even walked up twenty some flights of stairs to work - elevators were forbidden!!! This made me question why I waited sometimes 15 minutes for our lift, when I could simply walk up 4 floors in 5min. You battle this way throughout the whole movie . You naturally begin comparing your experience with theirs. You began to picture your life without this and that, experimenting with the thought of following in their footsteps. Once they lift the veil of environmental ignorance, changing certain things become no brainers. But some changes would be very drastic and dramatic; Some changes could even causes breakups with your live in companion. I took away two major things from the movie. a) Every Saturday I'm going to hit up our local farmers market. 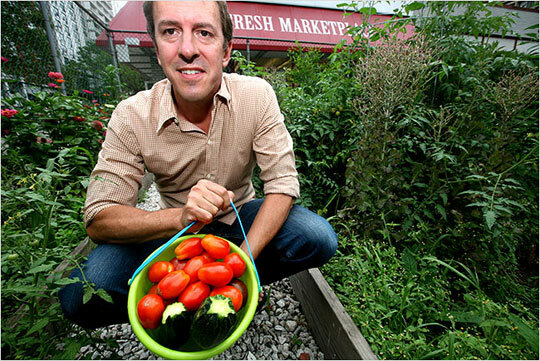 You know where your food is coming from, you can ask how its grown, and it frankly tastes better. Less emissions are transported in the shipping of food as well. c) I will not use a single plastic bag (see movie for tips)! e) I will use as little electricity as possible, right down to leaving things plugged in when I'm not using them. Starting with that and we'll see how it goes. Here is the other thing that really moved me-> At first Colin was doing this project to write a new novel that would give back to society and the planet. The experiment seemed to almost act as a new adventure at first. He seemed to like the idea of devolving, and camping out. However as the movie evolved, and when the media became more and more involved, he began to see that his actions would only make an impact if he a) inspired others to make small, maybe less extreme changes, and b) volunteered his time to local environmental organizations. Obviously the first is to bleed the information out to the rest of the world, starting with our loved ones. The second is that we need to start believing in the power of our individual actions; No matter how small we feel.